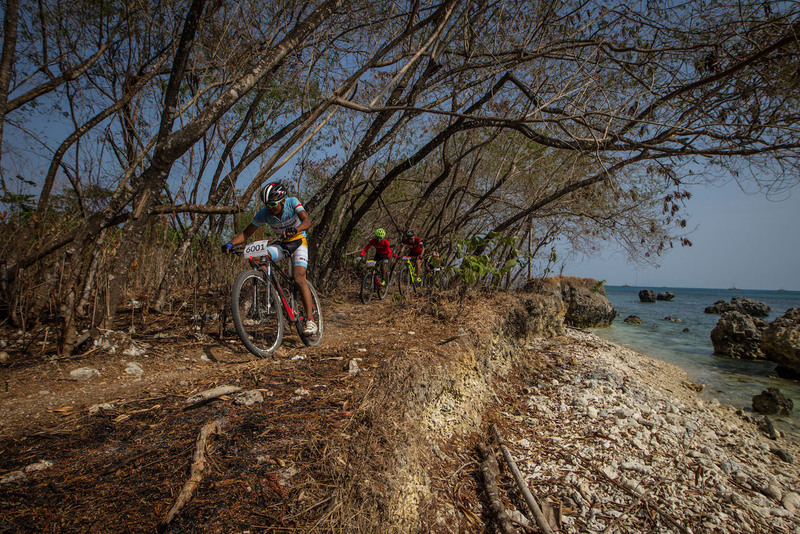 T anjung Lesung in Banten Province, was the location for what is claimed to be the first xterra triathlon in the country, named Rhino X-Triathlon. 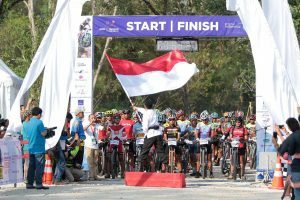 The event was part of the three-day event named Festival Pesona Tanjung Lesung 2017, with other events included Pandeglang 10K held on Friday, September 22; the Mountain-bike Cross-country marathon (MTB XCM) and Sunset Trail Run (STR) cross-country run, held on the following day. There were also Pasar Kolecer folk festival featuring Banten’s traditional culinary and arts, and kolecer (traditional propeller toy) and bebegig (traditional scarecrow) exhibition. 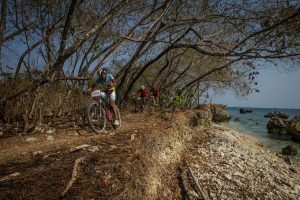 Taking place in the Beach Club Tanjung Lesung and the surrounding area, Rhino X-Triathlon is a cross-country triathlon divided into two categories: Bull and Rhino. In the Bull category, the triathletes competed in a 500-meter swim, an eight-kilometer cycling, and a five-kilometer run, while in the Rhino category, the triathletes competed in a 1,000-meter swim, a 16-kilometer cycling, and a 10-kilometer run. 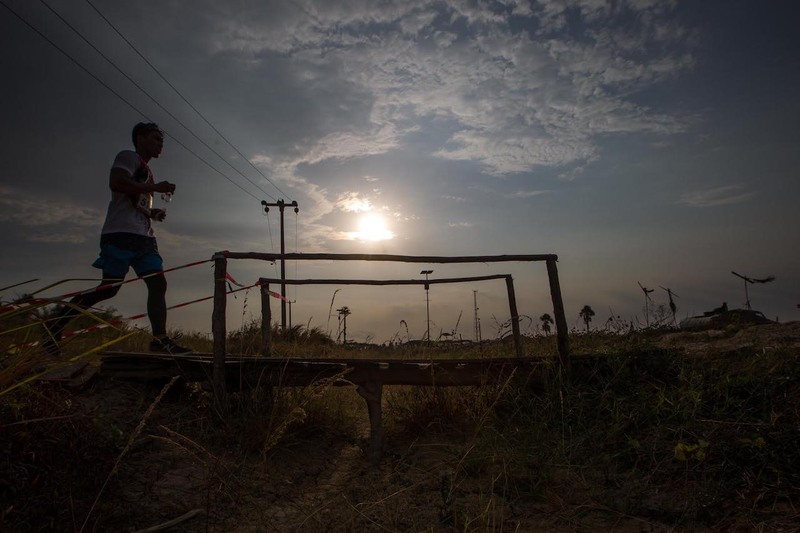 The triathlon was special, as for the cycling and running, the triathletes had to traverse off-road tracks, which are highly challenging but treacherous. Held on some of the hottest day of the year, Rhino X-Triathlon tested the triathletes with challenges many of them were not familiar with: The tracks for cycling and running include small dirt road with steep climbs and plunges, covered by loose rocks and corrals. “At kilometer 8, I fell off my bike at a steep drop and rolled three times,” said Muhammad Taufik, who despite what happened to him came out on top and won the Rhino Open category. Tanjung Lesung beach with all its beauty presented a challenge to the triathletes participating, which included several foreigners, like the Dutch-national, Maarten Vrouenraest, who participated in the Rhino Open category and reached the finish line the third. Tanjung Lesung is located on the western tip of the Java Island, facing the world-famous Mount Krakatau and not too far from Ujung Kulon National Park, home to one of the world’s most endangered species of animals, the one-horned rhinoceros. Tanjung Lesung is a popular tourism spot for the people of Banten, and especially those in Pandeglang. It is not as popular as other tourism spots on the island, though, despite its beauty. Located in Pandeglang Regency with its catchphrase The Sunset of Java, Tanjung Lesung beach is marked with many corrals and rocks, thus, developing this site into a more enticing tourism popular spots will be a challenge for the stakeholders.